Microsoft Power BI is a Windows application only, which means it doesn't run on a mac. For Mac users missing out of the new power horse sweeping the Business Intelligence scene, there is an effortless way to install and run Power BI on a Mac. Unlike traditional solutions (Dual Bootcamp, a local VM or using a 3rd party service) this method is Free, it's a real windows machine that you can upgrade and install any ODBC to work with Power BI, and it takes only a few minutes to set up and starts running. What do you need to run Power BI on a Mac? Before we get started we need to setup two things, a new account with Amazon AWS and downloading the Microsoft Remote Desktop 10 form the Apple store. If you're a new user to AWS then setting an account is easy and free, in fact, as a new user Amazon will give access to more free instances in your first 12 months. If you already have an account with AWS you'll still be able to take advantage of the free Windows Server instance that Amazon provides. Head over to Amazon AWS to sign up for a new account or to login to your existing account. The next step is to download Microsoft Remote Desktop 10. Remote Desktop is a free application that you you can download from the App Store. After you login to your AWS account, you'd want to navigate to the EC2 instance panel. You do this by clicking on Services from the top left menu and choosing EC2. The first thing you want to do next is choosing the region where this instance will be launched. AWS have many data centres around the world. A data centre is a large group of networked computer servers typically used by organisations for the remote storage, processing, or distribution of large amounts of data. The closest the data centre region is to your location, the less latency you will encounter in interfacing with the instance. In many cases, accessing a data centre that resides in the same city where you're located will provide a fluid response that feels you're accessing your own computer. 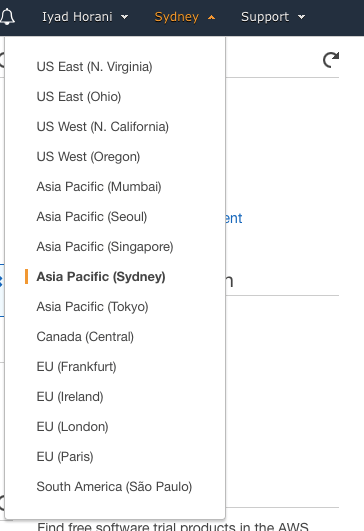 Once the region is selected, you'd want to create an EC2 Key Pair. Amazon EC2 uses public–key cryptography to encrypt and decrypt login information. Public–key cryptography uses a public key to encrypt a piece of data, such as a password, then the recipient uses the private key to decrypt the data. The public and private keys are known as a key pair. If you're a first time AWS user, then generating a Key Pair is essential. For existing AWS users, you can generate a new one for the Power BI instance or use an existing key pair. Generating a Key Pair is simple. From the EC2 interface, look for "Key Pair" from the left menu and click it. Once in the meanu, click to create a new Key Pair and give it a name. You're all set now to lunch the EC2 instance. From the same view, navigate back to Instances. From the view that gets displayed, click the Launch Instance button. You'll be presented with a series of steps to complete the launch process. The first one being choosing the Amazon Machine Image (AMI). Put simply, AMI is bundle of software packages and configurations that you can reuse to generate similar instance copies of the same type. Think of it like installing Windows on steroids, with other stuff being bundled in to make sure the machine can accept internet traffic and serve requests to internet users. From the search menu, type the word Windows and press enter to filter the list with only Windows machines. For the purpose of this guide, select the Microsoft Windows Server 2016 Base which shows it's eligible for free. Don't worry, you can always upgrade the instance at anytime without loosing any data. We'll cover how upgrade the instance later in this guide. Once select the wizard will ask you to select the instance type (CPU, RAM, GPU and Network) configuration. There are many choices to choose from. They differ in the pre-configuration that Amazon have built them. Basically you can either start with a Single CPU and 1 Gig of RAM, and customise the instance to any number of CPUs, RAM and Network interface. Or you can select a pre-configured instance. Selecting from the pre-configured choices allows for much predictable pricing, as AWS have made a list of different configuration along with their hourly pricing. Select the t2.micro, then click on Review and Launch. Click on Launch in the next view. You'll next be asked to select the Key Pair you want to associate it with this EC2 instance, from the drop down menu, find the Key Pair you created in step 2, check the acknowledge check-box and click on Launch Instance. You're almost done. From the summary view, click on the new instance ID to navigate back to the Instances view. You'll need to wait for 4 minutes before you can generate a password to access the instance and install Power BI. While waiting, click on the small pencil icon in the name field to give your instance a descriptive name. After the 4 minutes have passed, select the instance and click on Connect from the top menu. Click on Get Password, another will open asking you upload the Key Pair you downloaded into your computer. Once you upload it, click on Decrypt Password. The window navigates back to the first view with the Password for your instance revealed. At this stage, it is advisable to store those credentials in LastPass or 1Password. As AWS doesn't give you the ability to retrieve those passwords again. Also, safe keep the Key Pair. If you loose it you cannot download it again. You Windows Server 2016 instance is ready and now you can access it remotely and use it just like any other computer. So begin by launching Microsoft Remote Desktop 10. Now follow these steps to add the Instance to Remote Desktop. Click on the small "+" icon from the top window and Choose Desktop. For the PC Name: Copy the Public DNS and paste it in. For User Account, click to expand the drop down selector and select Add User Account. Fpr password, copy and paste the password from the AWS interface. Give the Administrator another friendly name if you want. Give the instance a friendly name. OPTIONAL: If you have a dual monitor, or you're using a 5K monitor, you might want to dial the resolution of the instance. This is because the t2.micro have limited resources and GPU power, with a dual monitor you'll notice some lagging in the interface, this is not because of the connection, instead the instance is struggling to keep up with the high resolution. In this case before saving, you can change the Display while creating the remote connection, or after the instance is shutdown, you can edit those settings. You're all set, all you have to do now is click on the the Desktop remote connection you've created. Now that you've logged into the instance you can begin installing Power BI and other software as well. I always begin by installing chrome, that's because Windows Server 2016 ships with Internet Explorer. This is a personal preference. Note one thing. With Windows Server 2016, the firewall is set to maximum, so any time you login to a new site, it will ask you if you want to allow the connection, you'll have to add all of the URLs to the allow list, it's an annoying step but it's required. Once you'e setup the preferred browser, head to Power BI website to download Power BI Desktop. On the Power BI website, scroll all the way to the bottom to find the download link for the Desktop version. Once the page appears, click on Advanced Download Options. From the window that shows, select the language and processed to select the version of Power BI desktop to download. I usually choose the x64 version. Once Power BI is downloaded, click on the file to install all. Then either create a new free account, or login to an existing account if you have one. Note: Because of the firewall, you might get an error the first time you try to login, if this happens, click on the top right where it says sign-in to sign-in again. And that's it, you have a fully working version of Power BI installed on a Windows Server. 1. How do you transfer files to the EC2 instance? Remote Desktop doesn't support drag and drop between your local computer and the EC2 instance, instead you can install DropBox or OneDrive on the instance for easy file transfer. 2. How to do a Right Click if you have a magic mouse? In this instance you can press the CTL key and left mouse button to simulate a right click. 3. How can you navigate between Apps? Use the Alt+Tab to navigate on a windows machine. 4. How to exit from the instance? You don't need to shutdown the instance, Windows Server is meant to be kept running. In fact, if you try to shut down or restart the instance, Windows will ask if for the reason for shutting down or restarting the server. Instead you can close the connection to the instance or quit Remote Desktop to leave the instance. The instance will still be running, so next time you login to the instance you can pick off where you left off.